One benefit of having a Facebook Page is that once you build up a healthy community, you can start directing them to your website to join an email list, sign a petition, donate or take some other action. But have you optimized your Facebook Page for this purpose? 1Your info tab should be optimized for search and viewers — overlapping goals. You optimize the info tab for search by filling in the appropriate fields with keyword-rich content. You can research the best keywords by using Google’s Keyword Tool and Google Analytics. You optimize your info tab for viewers by writing compelling copy for your info tab. Within your info tab, make sure your put your website URL in the URL field. Also, enter specific URLs to pages related to each section. 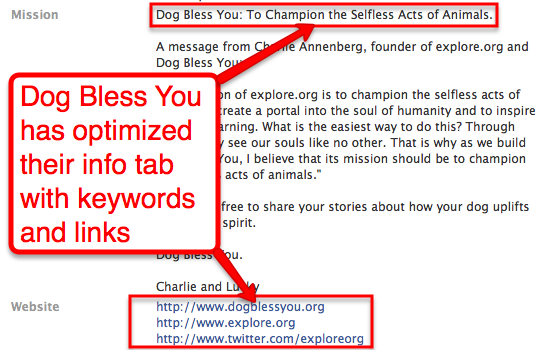 For example, in the “mission” add a link to the page on your site that talks about your mission. 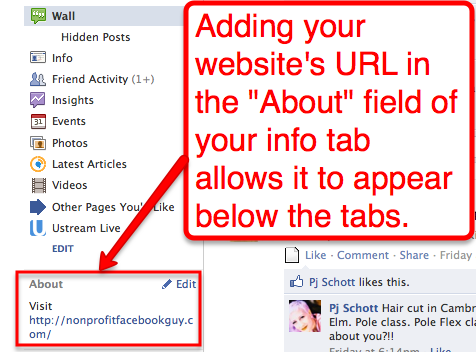 3Within your info tab, you can include your website’s URL in the “About” field. This creates a clickable link just below all the tabs on your Page, as shown below. 4When you select your “Manage Permissions” section of your Page, you can choose the default view for wall posts. “All Posts” means that posts by the Page and fans will be the first thing fans see if they visit your Page. Selecting “Only Posts by Page” means that only posts by the Page will be displayed in reverse chronological order as the default view (see below). Note: It’s recommended that you select “All Posts” if your goal is to increase engagement, but “Only Posts by Page” during those times when you want to have more control over content above the fold, including links to your website. 5It’s great to put links to your site in your website, but the reality is that most Facebook users see your content in their news feed. This is why you also want to publish Facebook Page stories that include compelling headlines, excerpts and links to your website. If you have a blog, you can use NetworkedBlogs or PostPlanner to automatically post blog posts on your Facebook Page with an RSS feed. And don’t use URL shorteners! 6A creative and unique way to drive traffic to your site is to post a video talking about specific content on your page. For example, you could post a video talking about a petition, or a fundraising campaign. And you don’t have to spend a lot of money to create these videos (hint: Flip camera or iPhone). Bonus points if you use YouTube. 7You can use Google Analytics to measure visits, page views, exit pages, time on your site and more by using UTM tags. Simply put, UTM tags allow you to easily append existing URLs on your site so that you can track them easier. For example, on the Inbound Zombie Facebook Page, I know exactly how many people click on the links and the banners on this tab with UTM tags. Same with Socialbrite’s Facebook Page (come like us!). Next week, I’ll dive a bit deeper into how to create UTM tags and how to analyze them in Google Analytics. What did I miss? What would you add? Great tips, John! 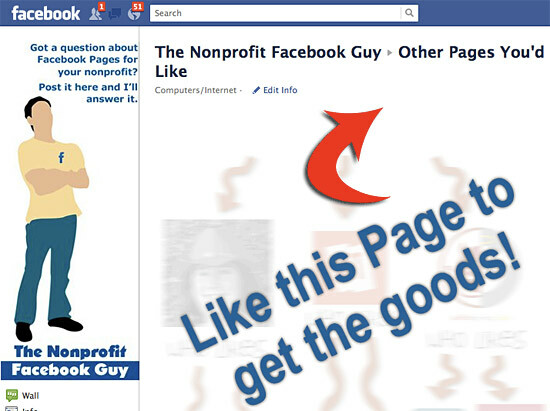 I’ve been hearing stuff about how Facebook’s News Feed is tricky to for pages to get onto. Any tips/thoughts on that? There are a lot of ways to “game the system” like pushing people to specific posts with email or sponsored stories. But yeah, updates from friends get way more airtime than updates from pages. Nice blog. One commend where I don’t agree: automatic feeds to your Facebook is something Facebook doesn’t like. These posts are less likely to show up in your fans timelines. @roosmarijn – True, very good point – but the payoff is saving time. You have to weigh the ding in edgerank alongside time saved. I’d recommend auto-posting via RSS in conjunction with manually updating the page. My advice to drive traffic to your facebook page– run ads. Ah– John, you’re right! We’re so used to companies flat out not getting traffic to their Facebook page that then getting to the site is a secondary problem. Good post, but I’m guessing that with Facebook’s recent announcement of a new Page, a lot of these tips will become dated. For example, the new Page Timeline will probably no longer have a need for tabs – thoughts? I was about to post a question about that, as well with the new timeline changes. Facebook provides the ability to implement paid social media marketing that can deliver messages to very targeted communities based upon the very finite demographic data that is captured from each user on registration. 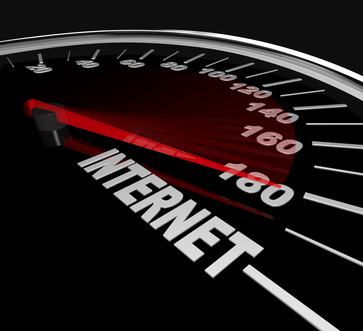 Social Media coupled with SEO and SEM can produce real benefits for SMB.